also when hosted on your own web server. Let’s look at how the demo application looks like. It’s a standard CRUD app that shows a list-detail pattern: http://janjongboom.com/ffos-list-detail/. You can click on items to go to the detail view, you can edit items, or add new items. The ‘+’ button is an install button (only visible in Firefox) and allows you to add the app to your phone (Android / FxOS). www folder as a packaged app. They will be combined into one big stylesheet, for optimal performance. img/, holds the icons for the app in three formats. main.js, bootstrap file based on RequireJS. index.html, bootstrap file where we load the application. You probably never will touch this. to enable offline for hosted applications. 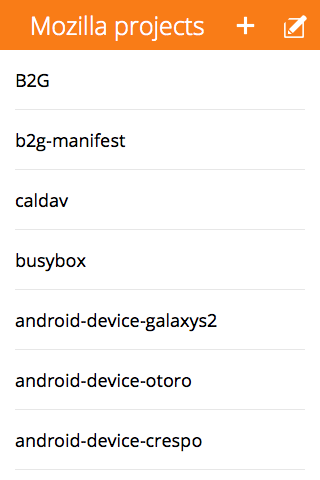 manifest.webapp, Firefox OS App manifest file. You don’t need any build chain set up during development, you can just edit files in www, and refresh index.html at will. That’s the power of the web :-) Of course if you’re developing in the app manager, press UPDATE to refresh the app. Now let’s add some new functionality to this application, so we can see how developing new features works in practice. Important here is the ng-tap attribute. When we tap this item we go to /credits URL, with animation popup. There are four built in animations: forward, backward, popup and popdown; but you can create your own using simple CSS. All this is always documented on the page on the Building Blocks website. Here we tell which controller we want to consult (with JS code), and which view (with HTML) belongs to that. Let’s create the view first. Add a new file called credits.html in the views folder. When we now click the button in the app, everything works as expected. The view pops in, we have data, and we can dismiss by clicking the back button. What’s also great is that when you send the URL to someone else (f.e. http://your/url/index.html#/credits) they will go to the same view by default. That’s because we do proper state management through URLs by default. The app currently only talks static data, so we want to hook it up to a real data source. In our case the project list should come from GitHub’s page with projects by mozilla-b2g. They have an API at: https://api.github.com/users/mozilla-b2g/repos. // This is only obeyed if there is an internet connection! This API is now asynchronous though, but that doesn’t matter for Angular. If you data-bind to a promise, Angular will wait until the promise resolves until data binding happens. The beauty here is now that even when there is no Internet connection, the data will still load (as long as it was loaded at least once), and the data is auto-cached. No need for the controller to worry about that. These were two ways we quickly added some functionality to this application. First, adding a new button and a new view; and second, showing data binding and offline caching of server data. Please note that this application template can be used for much more than just list->detail applications, you’ve got the whole power of AngularJS at your hands! Create a hosted application. This is an app that lives on your own server, like any mobile website. Hosted apps can still be published on the marketplace, and will work offline, but cannot use all the APIs in Firefox OS due to security limitations. Create a packaged application. This is a ZIP file, similar to APK files on Android, that contain all the assets of your app, and are distributed through the marketplace. Both of these applications can be generated using our build script. The script will create a new folder dist/ that lists all the files the app needs. If you want to publish the app to your own server, just copy over the contents of the folder. If you want to publish the app as a packaged app, ZIP up the content and publish to the marketplace. Nice tutorial but personally I don’t like using large frameworks for Firefox OS apps because Mozilla’s current target market is low-mid end phones and I always keep performance in mind. Totally true. But it’s also easy to lose track of performance and do stupid things; making nice view transitions is something that goes wrong more often than not. The app that we have here runs fast with smooth animations also on the lowest end devices. Hola , yo desarrolle una aplicacion para firefoxOs usando jquery , asi que decidi cambiar a angular , pero tengo un problema con el servicio $http , pues al crear una peticion a un servidor externo, este no me lo permite por las politicas de seguridad de firefoxOs , saben si en b2g se arreglara esto ? , o creen que deberia ser la gente de angular los que modifiquen su codigo. My Spanish is a bit limited, so I’ll stick to English here. Best place to ask for help for that should be on Stack Overflow in the firefox-os tag. Good luck! I’m going a bit out of topic but I think I’d be nice if Mozilla focused on building one framework based on modern web technologies with a coherent feeling across all devices and mozilla products. For eg Google is taking a step forward with Polymer: they implemented their “Material Design” in Polymer, developed a visual UI editor that goes with Polymer and they implemented it on Android, in their web services (eg new GMap website)and soon on chrome OS and their other products. We can feel that Google is preparing a future where the web app will be 1st class citizen, cross platform, and with the same “Material Design” feeling on all their products. There are also Gaia building blocks but they aren’t based on web components and they don’t constitute a real framework. There is https://apps.webmaker.org/designer but here again it doesn’t use Brick or Gaia and doesn’t even feel like a FFOS app. It feels like we have no clear design rule nor advised framework/UI to use. It’s true that we should let the dev who want use their own framework or design but we should build a recommended unified framework that fits Mozilla design and that is based on the latest most recommended web technologies. Otherwise FFOS will end up in meltingpot of Bootstrap/Foundation/React/TopCoat/Gaia/Ionic/KendoUI/Framework7/WinJs design styles which promise to be quite ugly. Just “guidelines” will not suffice to bring a good UX because the UX is also about components,gestures,animations,transitions,etc… which cannot be described in one CSS file and adapted to any underlying MVC framework, that’s why It’d be nice that Mozilla develop it own framework. Thanks for your thoughts. Many different things to address there. To begin with, we welcome Google’s efforts with Polymer and offering that as an option to developers. However, at the same time, we wouldn’t want to limit the option to developers to just one library or approach (eg. there would be one Google one, one Mozilla one etc) but work to make sure all are viable approaches. I understand what you mean, though, and it’s definitely something to consider when it comes to design and user experiences. On Brick, 2.0 is on its way and you can read the latest update from July this year. On the theme between our products and their respective UIs, I think it’s valid input for our design and consistency, and I’ll forward that to our creative team. Thanks a lot for your reply and for the link.